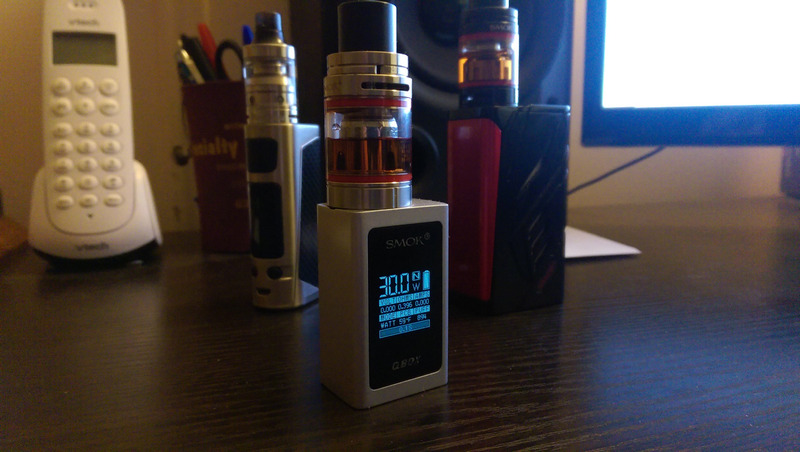 The Q-BOX is Smok's mini mod. The Q-BOX mod is a built-in battery mod supporting up to 50 watts of power, depending on the tank or rebuildable you put on top. The built-in battery has a large capacity of 1600mah. The large LED screen shows you the following information: mode (wattage or temperature mode), voltage, resistance and amp current, puff counter, current wattage and/or temperature, and current battery charge. The Q-BOX supports both wattage mode for all wattage coils (from 0.1 ohms to 3 ohms), and temperature mode for Nickel, Titanium and Stainless Steel coils (from 0.06 ohms to 3 ohms). The temperature range is between 100-315 degrees Celsius (200-600 degrees Fahrenheit). The device is tiny, measuring just 54.8mm tall, 33.6mm wide and 25mm deep.